We've just started on the Road to the Isles path from Corrour railway station across the high Rannock Moor to Glen Nevis and onward to Fort William. 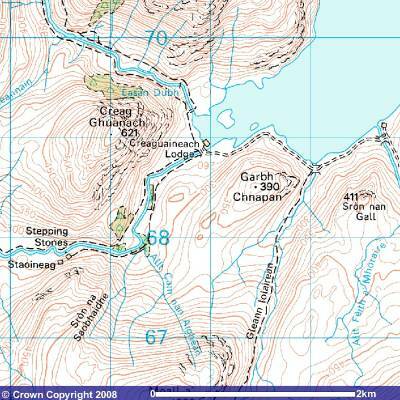 The track from Corrour Station (seen on the Ordnance Survey map below as a double dotted line) has come down from the rail line and run along the south shore of Loch Trèig. If you were to cross the bridge, pass Creaguaineach Lodge, and follow the paths to the northwest, they improve into a rough track leading to Roy Bridge and Spean Bridge. However, for The Road to the Isles, turn to your left and follow Abhainn Rath to the southwest. You make this turn at NN 309 688. If you take the south bank of Abhainn Rath, the going will be very boggy in places. At times it will be difficult to find the best route, and the "best route" is really nothing but the least difficult. You will also need to cross some inconveniently deep, wide, and fast-flowing tributary streams. 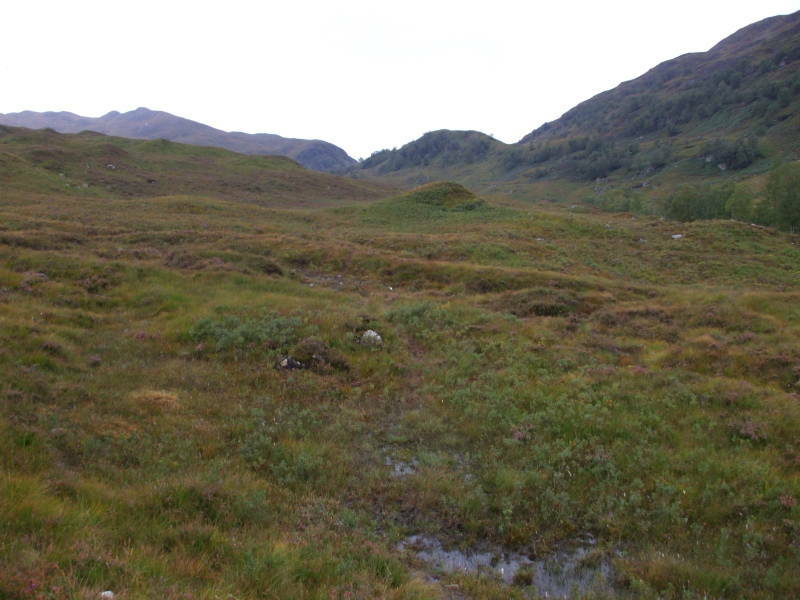 On the other hand, if you take the north bank of Abhainn Rath, you will experience the same problems. The north end of Loch Trèig. Whichever route you take, your next goal is Staoineag Bothy, seen on this map. Since that's on the south side, I followed the south bank and would suggest doing the same. The path goes toward the center of this view. Really. There's a path here. Mind the boggy parts. 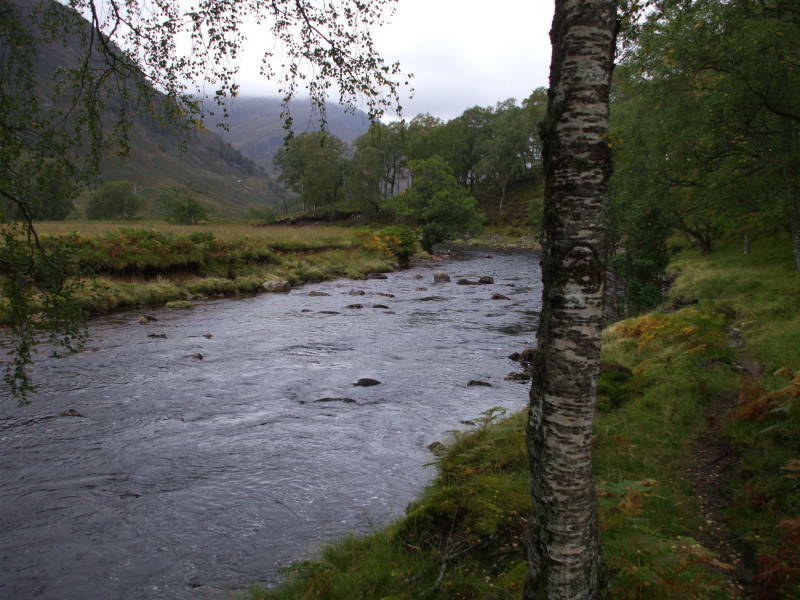 Continuing upriver along Abhainn Rath. The path immediately beyond leaving the shore of Loch Trèig gives you a sudden introduction to route-finding on the moors. There is so little traffic that there is no visible path in places. A little further along, the path becomes distinct along the south bank of Abhainn Rath. At this point you may be getting ready for a break. Do resist the urge to eat the local flora. Remember, all mushrooms are edible. Or at least you can eat any mushroom one time. 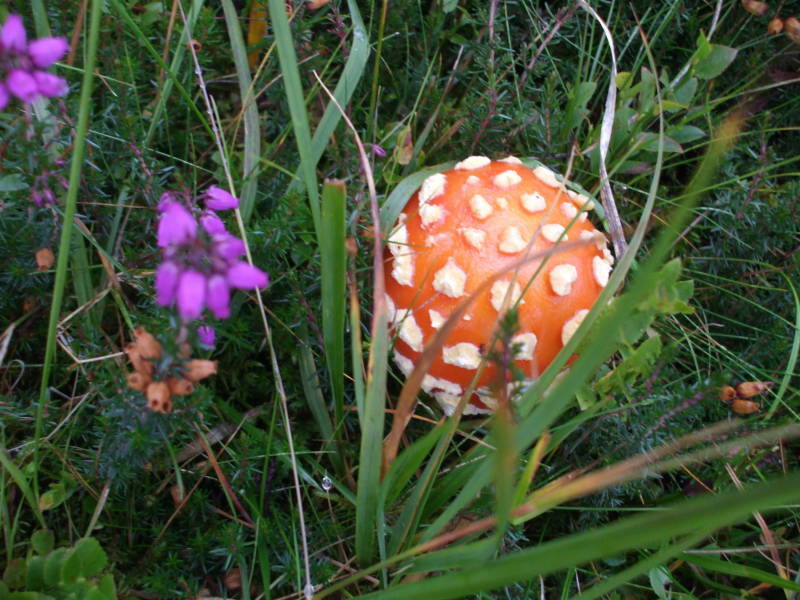 You want to hold out for the mushrooms that are edible multiple times. Staoineag Bothy comes into view before too long, as the valley opens up. 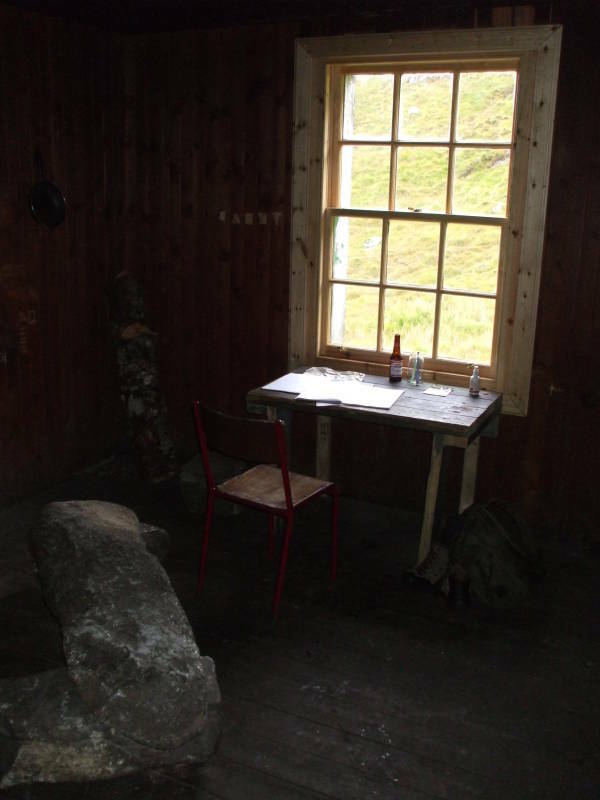 A bothy is a shelter in the Highlands. 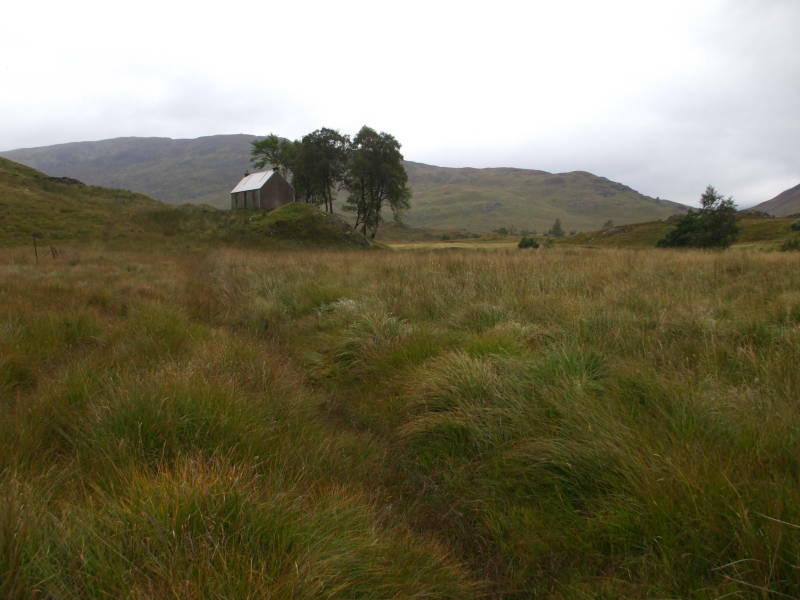 Staoineag Bothy is at NN 295 677. 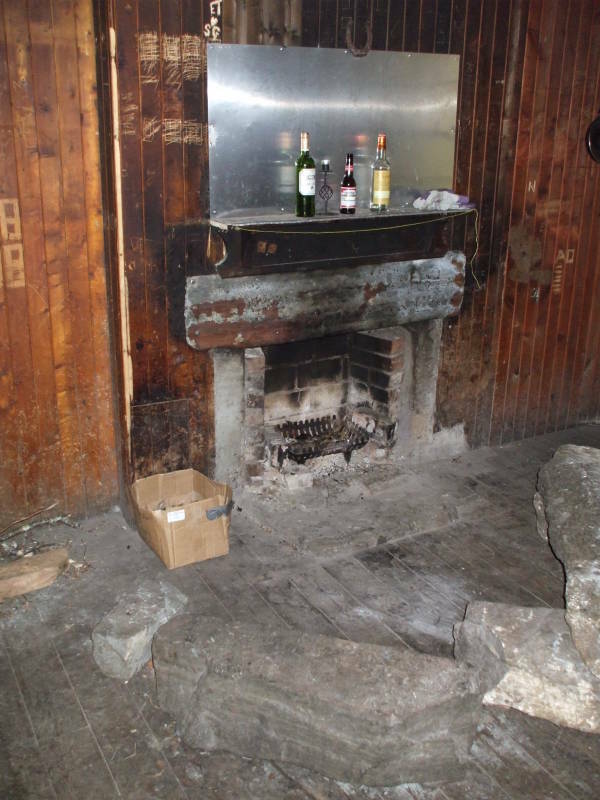 Staoineag Bothy has a couple of rooms with fireplaces on the ground floor, and a loft above that could house a number of hikers. I arrived at Staoineag Bothy about 1120 and stopped to rest and eat lunch. The last overnight guest had signed into the logbook a week before. As you can see, some of the overnighters had enjoyed a wee dram of the local product.